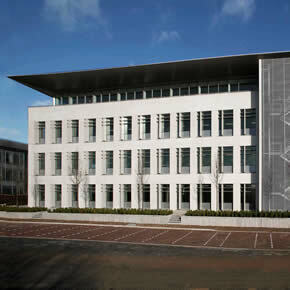 Based in Slough, the new building is part of a large campus, which spans 200,000 square feet. It has been shortlisted for the 2010 RIBA Awards South, after obtaining a UK Commercial Property Award and an International Property Award. The project’s architect, Nicholas Hare, invited Alumasc to assist with the development of the building’s fascia and soffit system from the initial design phase. Alumasc proposed a bespoke Skyline system with a nosed design: various CAD drawings were produced to show how the pointed section could be supported by concealed webbed brackets. The designs also demonstrated how the system would appear on different building elevations. The nosing connects to sloping soffits, which were created in modular form; each section was manufactured at 500mm wide to ensure that the joint coincided with the mullions. Alumasc worked in close conjunction with the installer, S & J Roofing, to achieve a final fitting true to its initial design. Manufactured from polyester powder coated aluminium, Skyline is often specified for new build roof perimeters. It is available in four standard shapes; however, Alumasc offers a bespoke design service to ensure individual project requirements can be met. Lightweight and weatherproof, it was easy to handle and install, providing a contemporary design solution for the new building.